Ali Hamze, NU’s Caf Director, started this year’s Last Lecture series with an inspiring testimony about trusting in God’s plans. Migrating from Lebanon to the United States in 2009 with the plan to earn his MBA, Hamze began his journey with a language barrier, which led to academic struggles. Instead of returning home, he transferred from a university in North Carolina to California, where he worked to continue his education. Hamze uses this passage to emphasize an unconditional trust in God’s greater plan for our lives. 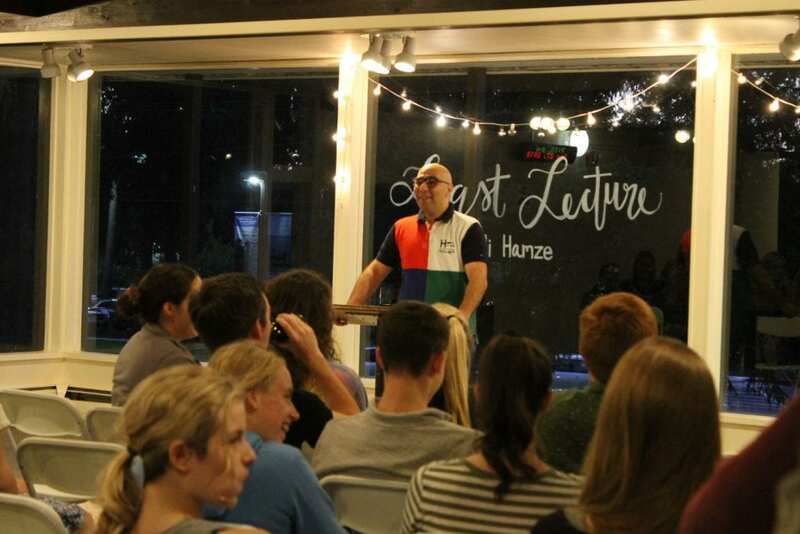 As seen within his own life, Hamze explained that his initial plans changed due to his experience working in college cafeterias, meeting his wife, and his conversion to Christianity. “God orchestrated a beautiful, beautiful, beautiful plan that took me awhile to figure out,” Hamze said. Speaking Arabic and French, Hamze was gifted Bibles in both languages, which were influential in his search for an understanding of the Christian faith. He recognized that his life had taken a path far different from the one he initially imagined, but said he realized that this path was greater because it was God’s plan. “The Lord is leading me. God is telling me, ‘this is your plan, son, do it. This is your plan, I’m opening it for you. I didn’t tell you—I’m showing you the way,’” Hamze said. Hamze explained that his life, thus far, has been filled with an immeasurable love and joy from following this path. His trust in God’s plan has led to a new love for people, which he shows every day in the Caf. Hamze’s love for people inspires his leadership style with the Caf staff. “I lead based on love and respect, and that’s how things have been changed,” he said. While some may see the Caf as only a place for a meal, Hamze strives to create a friendly and loving environment where people can escape the struggles of life to enjoy God’s gift of fellowship. “God has put me in the right place and I trust in Him with all my heart and all my body,” Hamze said. Hamze encourages everyone to pursue God’s plan within their own lives. He said that God’s love may be seen through all actions—known and unknown. Hamze’s own trust in God’s plans have encouraged him to spread this love and respect to everyone. His own experiences may not be immediately applicable for everyone, but the concept of willingly pursuing and following God’s plans with a trusting heart can inspire all to take the time to seek out the greater purpose of one’s fleeting life. “I really encourage everyone that if they don’t know what’s going on in their life or they don’t know where they are going in their life—you are here for a reason just like mine,” said Hamze.